If you’re working out for some time now, you probably know this scenario: you wanted to gain as much muscle mass as possible before an event, so you had a serious bulking phase of 2-4 weeks. You trained hard at your local gym and increased your calories accordingly and ended up with a 10-pounds gain. But then you look in the mirror and realize that the only part that got bigger is your gut; you gained more fat than muscle. The truth is that you simply can’t gain 10 pounds of lean muscle in just 2 weeks. According to specialists at the National Strength and Conditioning Association, you can gain just about 1 pound of lean muscle per week, and only with hard training and smart eating (which is really difficult). 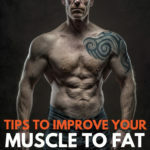 Usually, an average guy can gain about half a pound of lean muscle per week and probably 1 pound per week on the scale, because of the glycogen increase and water retention that comes along. But if you gain more than 4 pounds in a month, it means that you’re adding on fat as well. You probably already know that protein is essential for building muscle and you need 1 gram of protein per pound of body weight for good results. You also need to spread it evenly throughout the day, in 4-6 meals. But it’s important to get your protein from multiple sources, and not just focus on meat and eggs all day long. Your body needs all 20 essential amino acids and you can’t get all of them from one or 2 sources. If possible consume a different source of protein at each meal, and include both animal and plant protein. Read more about the best sources of protein at this link: Muscle Friendly Protein Foods. Each time you eat, you give your body the opportunity to start the protein synthesis process. By consuming small and frequent meals, you can manage your appetite and limit the drops in blood sugar that usually result in poor eating choices. This way you will also avoid eating too much in one sitting, because you won’t be that hungry. Aim for 5 healthy meals a day in order to gain muscle and not fat. But once a day, give yourself a treat! You may think that a cheat meal every day is too much, but let’s look at the big picture: if you eat 5 meals a day, then you’ll be eating 35 meals a week. Just 7 of those will be cheat meals, and that means only 20%. The rest of 80% of the time you will be eating clean and healthy meals that will help you build lean muscle and not fat. The treat meals are only there to keep you sane and motivated. To reap the full benefits of a cheat meal, consume it right after your workout and try to have a 2 to 1 ratio of carbs and protein, with as few fats as possible. But if pizza, ice-cream or McDonald’s is your thing; go for that, just don’t overdo it! If you stick to the regular 5 meals a day, you won’t be that hungry anyway. Fish oil has many health benefits for your heart, your brain, your immune system and your vision but it can also help you to build more muscle. You may feel better consuming a popular mass gainer endorsed by a huge bodybuilder, but Omega 3 can be very beneficial in your muscle building journey as well. It will help you by improving insulin sensitivity, meaning that you can use glucose more effectively, and gain muscle instead of fat. It also reduces inflammation and soreness, meaning that you can recover better after intense workouts. Some studies have also shown that Omega 3 improves protein synthesis. Implement these 4 tips into your diet in order to make sure you get the most out of your bulking phase. That means you end up with ripped chest and arms, and not a spare tire around the middle.